A biography by Götz Mecklenburg. Peter Harradine has very kindly sent us a copy of this book celebrating the life of his father. The book is in German, but will soon be translated into English. 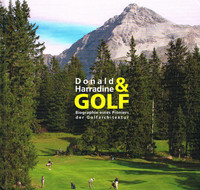 Don Harradine established the present company by designing and building his first course in Switzerland in the year 1929 and pursued an illustrious career until his retirement in the mid 80's. A round up of recently published articles from a range of magazines and online newsletters. All the usual titles have been covered, including the latest issues of Golf Range News, Golf Management Europe, Greenkeeper International and Greenkeeping.